As of right now, I do have some dreams for the future. Over the years, I have thought long and hard about this, and I have come to form certain hopes for myself. They are not many, but they are truly meaningful to me. 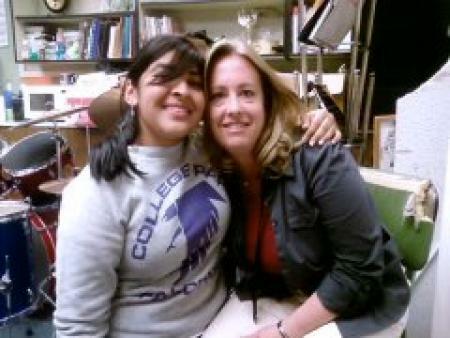 The picture I chose to share is of me and one of the greatest teachers I have ever had, Ms. Thompson. Her support, encouragement, and all-around great attitude and personality inspired me to take up music when I was in middle school. I spent countless hours hanging around in her band room after school, where I observed something that I still find to be very, very rare... I saw someone with a true passion for something. She was in love with making music, and sacrificed much in order to share her passion with us. She had countless students who loved her to death, doubtless it was because they sensed this as well. She cared for all of us, and she really affected me in a positive that I will never forget.